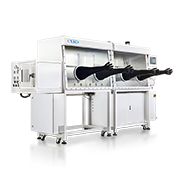 Universal - Vacuum Technology Inc.
From single to multiple workstations, the VTI Universal glove box provides you with the space and systems needed to maintain your inert environment while still allowing production scale use. 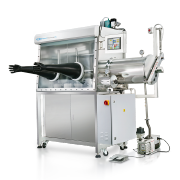 All Universal glove boxes provide an integrated gas purification system, PLC controlled electronics, as well as an HMI touchscreen. 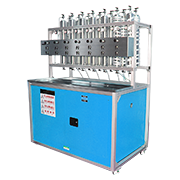 Each workstation includes replaceable sight glass, as well as (4) KF40 feedthrough ports. 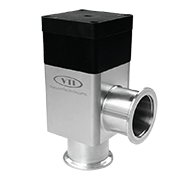 Our standard configurations include transfer antechambers, as well as an Edwards vacuum pump. All VTI Universal Glove Boxes have an attainable purity level of <1 PPM of O2 and H2O. Inert gas in a closed loop. The gas is circulated by the blower and purifier, H2O, O2 can be removed continuously. The replacement of the atmosphere inside the glove box can be achieved automatically by the purging valves. H2O and O2 removal material can be regenerated. The regeneration process can be program controlled. The pressure in the glove box is controlled automatically by the Programmable Logic Controller (PLC). Working pressure can be set either between +15mbar and -15mbar or between +12mbar and -12mbar. If the pressure goes over the set range, the system will be protected automatically. Lighting: External LED lights, front mounted above sight glass. 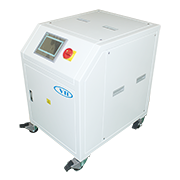 Capacity to remove oxygen, 60L , moisture 2000g. Regeneration: PLC control all process including heating, introducing mix gas (working gas mixed with Hydrogen 5-10%), etc. For more information, please view our specification sheet. 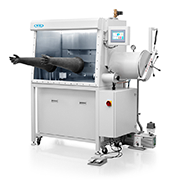 Integrating customer’s instruments into the glovebox, like evaporator, ALD System and Spin Coater etc.